(a) Remove the transfer case No.1 plug. (b) Remove the gasket No.1 from the transfer case No.1 plug. (a) Remove the transfer case No.2 plug. (b) Remove the gasket No.2 from the transfer case No.2 plug. (a) Remove the transfer drain plug and bleed the transfer oil. (b) Remove the drain gasket from the transfer drain plug. (a) Remove the 5 bolts and the stiffener plate RH. (a) Remove the 3 bolts and the engine mounting bracket RR. (b) Using a plastic hammer, remove the transfer assy from the transaxle assy. Remove the transfer assy from the transaxle assy without tilting it. When removing the transfer assy, do not hold onto the oil seal parts on both sides of the assy. (a) Remove the transfer cover gasket from the transfer assy. (a) Using a screwdriver and a hammer, remove the transfer case breather plug from the transfer case cover No.1. NOTICE: Be careful not to damage the contact surface of the case cover No.1. (b) Using a brass bar and a hammer, remove the transfer case cover No.1 from the transfer. (a) Remove the bolt and breather oil deflector from the transfer case cover No.1. (a) Remove the 3 bolts and the transfer dynamic damper from the transfer extension housing sub-assy. (a) Remove the 4 transfer & transaxle setting stud bolts. (a) Fix the transfer assy to the overhaul attachment. (a) Using a plastic hammer, remove the transfer extension housing dust deflector from the transfer extension housing sub-assy. (a) Using SST, remove the transfer extension housing type T oil seal from the transfer extension housing. (b) Using a plastic hammer, remove the transfer extension housing sub-assy from the transfer case. (a) Using SST and a torque wrench, check the initial torque within the backlash range. If the value is out of standard range, replace the driven pinion bearing. (b) Using SST and a torque wrench, check the initial torque while the driven pinion is in contact with the ring gear face. (a) Set the dial indicator perpendicular to the tooth face of the ring gear, fix the driven pinion and inspect the backlash while moving the gear. NOTICE: Inspect it at 3 points or more on the gear's periphery. HINT: Write down the result. (a) Apply red lead primer thinly and uniformly to both faces of the ring gear and rotate several times. 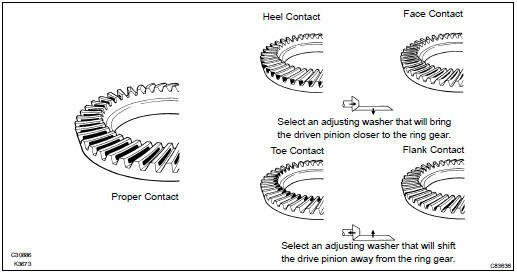 NOTICE: Inspect the tooth contact on the ring gear at 4 places or more. (b) Proper washer location is shown in the illustration. (b) Using SST, remove the CTR differential lock sleeve. (a) Using SST, remove the transfer case oil seal from the case. (a) Using SST, remove the transfer RH bearing retainer oil seal from the transfer RH bearing retainer sub-assy. (a) Remove the 7 bolts from the transfer RH bearing retainer sub-assy . (b) Using a screwdriver and a hammer, create a clearance between the transfer RH bearing retainer sub-assy and the transfer case. NOTICE: Be careful not to damage the transfer RH bearing retainer sub-assy and the transfer case. (c) Using SST, remove the transfer RH bearing retainer subassy from the transfer case. (a) Using a screwdriver with the tip protected by vinyl tape, remove the 2 O-rings from the transfer RH bearing retainer sub-assy. NOTICE: Be careful not to damage the retainer's grooves for the Orings. (a) Fix the transfer RH bearing retainer sub-assy in a vise. (b) Using SST, remove the center differential case tapered roller bearing RH outer race, transfer ring gear mounting case washer No.2 and right bearing retainer oil seal No.2 from the transfer RH bearing retainer sub-assy. NOTICE: Be careful not to damage the oil-seal-fitted surface of the transfer RH bearing retainer sub-assy. (b) Remove the side gear shaft holder bearing from the transfer RH bearing retainer sub-assy. (a) LH side: Using SST, remove the inner race of the center differential case tapered roller bearing from the transfer ring gear mounting case. NOTICE: Apply grease to the screw thread and tip of the SST before use. HINT: When the roller comes off due to deformation of the gauge, completely remove the roller and remaining inner races of the center differential case tapered roller bearing from the transfer ring gear mounting case. (b) RH side: Using SST, remove the inner race of the center differential case tapered roller bearing from the transfer ring gear mounting case. HINT: If the runout is too large, replace the transfer ring rear mounting case. (a) Using a dial indicator, check the transfer ring gear mounting case runout. HINT: If the runout is too large, replace the center differential control coupling assy or transfer ring gear mounting case. (a) Using SST and a hammer, unstake the transfer gear nut. (b) Using SST, remove the transfer gear nut. Put a shop rag around to help prevent the driven pinion from being dropped. Place something like wooden blocks under the case to keep it level. (a) Using SST and a press, remove the transfer driven pinion front bearing inner race from the driven pinion. (a) Using a brass bar and a hammer, lightly strike the center differential case tapered roller bearing LH outer race at 2 points to remove it from the transfer case. (a) Using a brass bar and a hammer, lightly strike the transfer driven pinion front bearing outer race at 2 points to remove it from the transfer case. (a) Using SST and a press, install the transfer driven pinion rear bearing outer race to the transfer case. NOTICE: Place something like wooden blocks under the case to keep its level. (a) Install the transfer output washer to the transfer case. (a) Install the transfer driven pinion front bearing outer race to the transfer case with SST, bolt and nut. (a) Install the ring gear mounting case plate washer to the transfer case. (a) Using SST and a press, install the center differential case tapered roller bearing LH outer race to the transfer case. (a) Using SST and a press, install the transfer driven pinion front bearing inner race to the driven pinion. (b) Install a new transfer pinion bearing spacer and a new transfer driven pinion rear bearing inner race to the driven pinion. NOTICE: Do not stake the transfer gear nut. (a) Using SST and a torque wrench, measure the initial torque of the driven pinion. HINT: Use a torque wrench with a fulcrum length of 160 mm (6.30 in.) NOTICE: Measure preload after rotating the bearing both clockwise and counterclockwise to make it fit. (b) If the preload is too large, replace the transfer pinion bearing spacer with a new one. (c) If the preload is too small, repeatedly adjust the preload by tightening the transfer gear nut 5 to 10 degrees at a time until the standard value is obtained. (d) If the preload is insufficient, even though the tightening torque of the transfer gear nut exceeds the maximum of the standard value, loosen the transfer gear nut and apply gear oil SAE 90 (GL-5) to the transfer gear nut and the screw thread and the base of the driven pinion. And then repeat the preceding operation. If the tightening torque is smaller than the standard, replace the transfer pinion bearing spacer with a new one and adjust it. (a) Completely remove grease and moisture on the contact surfaces of the ring gear and the transfer ring gear mounting case. (b) Heat the ring gear in boiling water from 90 to 100 C (194 to 212 F). (d) Align the matchmarks on the ring gear and transfer ring gear mounting case and quickly assemble them. Tighten the bolts in diagonal order in splitting several times. After the ring gear has well cooled down, fully tighten the bolts. Make the bolt heads in order to check if they are retightened or not. (a) RH side: Using SST and a press, install the inner race of the center differential case tapered roller bearing to the transfer ring gear mounting case. NOTICE: When replacing the inner race, replace it together with the outer race. (b) LH side: Using SST and a press, install the inner race of the center differential case tapered roller bearing to the transfer ring gear mounting case. (a) Install the transfer ring gear mounting case to the transfer case. NOTICE: Damage to the spline, the bearing's rotating surface and gear face may cause a decrease in their strength. Care should be taken when installing them. (a) Install the transfer ring gear mounting case washer No.2 to the transfer RH bearing retainer sub-assy. (a) Using SST and a press, install the center differential case tapered roller bearing RH outer race to the transfer RH bearing retainer sub-assy. (a) Place the transfer with the face where the transfer RH bearing retainer sub-assy is to be installed facing up. (b) Center-align the transfer ring gear mounting case and the transfer case. (c) Insert the SST into the transfer RH bearing retainer subassy. NOTICE: Insert SST straight in order not to damage the oil seal lip. (d) Insert the transfer RH bearing retainer sub-assy together with the SST into the transfer case. NOTICE: Interference between the case and retainer, and between the transfer ring gear mounting case and SST should be carefully avoided. HINT: If the retainer cannot be inserted, tap it in with a plastic hammer. (e) After inserting the transfer RH bearing retainer sub-assy into the transfer case, remove the SST. (f) Tighten the 7 bolts. (a) Set the dial indicator perpendicular to the ring gear face, fix the driven pinion, and check backlash by moving the ring gear. (b) If the measured value is out of standard, select a proper washer for the center differential case tapered roller bearing on the LH side from the table below and install it to obtain the standard value. HINT: When the backlash is larger or smaller than the standard, select a thinner or thicker washer respectively. 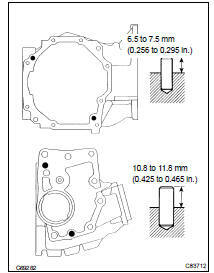 (c) Ring gear mounting case plate washer location is shown in the illustration. (a) Apply red lead primer thinly and uniformly to both faces of the ring gear and rotate it several times. 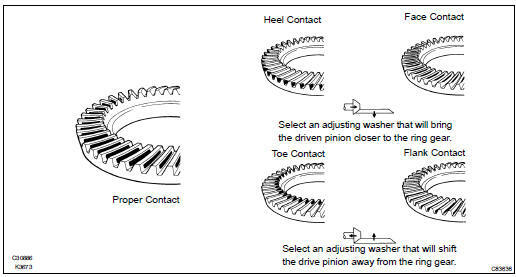 NOTICE: Check the tooth contact on the ring gear at 4 places or more. (b) Observe the pattern shown by red lead primer. (c) In case of poor tooth contact, select a washer for the driven pinion bearing front side from the following table and replace it. NOTICE: If the washer thickness is changed, the backlash will be also changed. (d) The location of the transfer output washer for tooth contact adjustment is shown in the illustration. (a) Using SST and a torque wrench, measure the initial torque with the driven pinion being contact with the ring gear face. NOTICE: Before measurement, rotate the bearing in both directions several times to make it fit. HINT: Use a torque wrench with a fulcrum length of 160 mm (6.30 in.). (b) If the value is out of standard range, select the washer for the center differential case tapered roller bearing RH side from the following table and replace it. (c) The location of the transfer ring gear mounting case washer No.2 for preload adjustment is shown in the illustration. (d) Using a chisel, stake the transfer gear nut. (b) Using a screwdriver and a hammer, make a opening between the transfer RH bearing retainer sub-assy and the transfer case. (a) Fix the transfer RH bearing retainer sub-assy in a vise.z (b) Using SST, remove the center differential case tapered roller bearing RH outer race and transfer ring gear mounting case washer No.2 from the transfer RH bearing retainer sub-assy. (a) Install the side gear shaft holder bearing to the transfer RH bearing retainer sub-assy. (b) Using snap ring pliers, install the side gear shaft holder hole snap ring. HINT: Check that the side gear shaft holder hole snap ring fits in the groove of the transfer RH bearing retainer sub-assy. (a) Using SST and a press, install the transfer RH bearing retainer oil seal No.2 to the transfer RH bearing retainer sub-assy . NOTICE: Carefully press-fit so that the oil seal will not be tilted. (b) Apply small amount of MP grease No.2 to the oil seal lip. (a) Install the selected transfer ring gear mounting washer No.2 to the transfer RH bearing retainer subassy. (a) Coat 2 new O-rings with hypoid gear oil. (b) Install the 2 O-rings to the transfer RH bearing retainer sub-assy . NOTICE: Be careful not to twist the O-ring but to fit it properly in the retainer's groove. (a) Place the transfer with the surface where the transfer RH bearing retainer sub-assy is facing up. (b) Align the centers of the transfer ring gear mounting case and the transfer case. (c) Insert SST into the transfer RH bearing retainer subassy. NOTICE: Insert SST straight in order not to damage the oil seal. (d) Insert the transfer RH bearing retainer sub-assy together with SST into the transfer case. Avoid interference between the case and the retainer, and between the SST and the transfer ring gear mounting case. Carefully check the retainer's O-ring for damage and incorrect fitting. HINT: If the retainer cannot be inserted into the case, tap it in with a plastic hammer. (a) Using SST and a torque wrench, measure the initial torque with the driven pinion being in contact with the ring gear face. Use a torque wrench with a fulcrum length of 160 mm (6.30 in.). If the preload is too large, inspect the transfer RH bearing retainer sub-assy. (a) Using SST, install the transfer RH bearing retainer oil seal to the transfer RH bearing retainer sub-assy to the position as shown in the illustration. NOTICE: Install the oil seal carefully so that it will not be tilted. 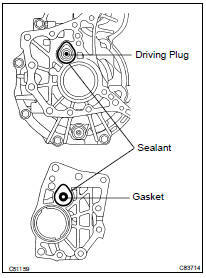 (a) Using SST, install the transfer case oil seal to the transfer case at the position as shown as in the illustration. (b) Apply small amount of MP grease to the oil seal lip. (a) Coat a new O-ring with hypoid gear oil. (b) Install the O-ring to the CTR differential lock sleeve. (c) Using SST, install the CTR differential lock sleeve to the transfer case. (d) Using snap ring pliers, install the shaft snap ring. NOTICE: Check that the snap ring is fitted in the groove of the ring gear mounting case. (a) Using SST, install the transfer extension housing type T oil seal to the transfer extension housing at the position as shown in the illustration. (a) Using SST and a press, install a new transfer extension housing dust deflector to the transfer extension housing sub-assy . (a) Apply sealant 1281 to the transfer extension housing sub-assy in continuous beaded form of 1.2 mm diameter as shown in the illustration. Wipe any grease off from the attaching surfaces. Install the transfer extension housing sub-assy within 10 minutes after applying the sealant. (b) Install the transfer extension housing sub-assy to the transfer case with the 4 bolts. (a) Install the 4 transfer & transaxle setting stud bolts to the parts of the transfer case as shown in the illustration. NOTICE: Install the sealant-coated side of the transfer & transaxle stud bolt to the transfer case. (a) Using a plastic hammer, install the 4 transfer case straight pins to the transfer case as shown in the illustration. (a) Install the transfer dynamic damper to the transfer extension housing sub-assy with the 3 bolts. (a) Install the breather oil deflector to the transfer case cover No.1 with the bolt. NOTICE: Be careful of the direction of the deflector's fold. (a) Apply sealant 1281 to the transfer case cover No.1 in a continuous bead of 1.2 mm diameter as shown in the illustration. Install the transfer case cover No.1 within 10 minutes after application of the sealant. (b) Install the transfer case cover No.1 to the transfer case with the 8 bolts. (a) Using SST and a hammer, install the transfer case breather plug to the transfer case cover No.1. (a) Install a new transfer cover gasket to the transfer case. (a) Apply sealant 1281 to the transaxle assy and the transfer assy in continuous beaded form of 1.2 mm diameter as shown in the illustration. Install it within 10 minutes after applying the sealant. Sealant stuck on the gasket, case oil seal and driving plug may cause oil leakage and seizure due to oil shortage. Care must be taken. (b) Install the transfer assy to the transaxle assy with the 2 bolts and 6 nuts. Check that the gasket is installed to the transfer assy before instaling them to the transaxle assy. Install the transfer assy to the transaxle assy without tilting. When moving the transfer assy, do not hold the oil seal on the both sides. (a) Install the engine mounting bracket RR with the 3 bolts. (a) Install the stiffener plate RH with the 5 bolts. (a) Install the transfer drain plug with a new drain gasket. (a) Install the transfer case No.2 plug with a new gasket No.2. (a) Add oil up to 0 to 5 mm below the lower side of the plug hole. HINT: When adding oil, pour it slowly. (b) Install the transfer case No.1 plug with a new gasket No.1.